Need to release Matrimonial Classified Advertisement in Dainik Jagran Newspaper under Bride or Groom Wanted Section? Don’t worry!! It is more easy and simple through online ad booking process which is secure for processing payment. 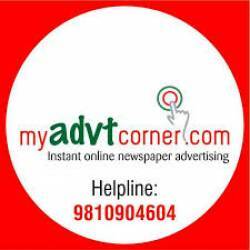 Myadvtcorner is authorised and INS accredited Advertising Agency provides online ad booking service through our user friendly and secure ad booking website which allows for booking text classified and classified display ads for Dainik Jagran Newspaper for Any Edition from Delhi NCR, Bihar, Punjab, Lucknow, Dehradun, Aligarh, Meerut, Gorakhpur, Varanasi, Jammu & Kashmir, Bareilly, Jharkhand, siliguri, Agra and others. If you are looking for perfect bride or groom through giving matrimonial advertisement in Dainik Jagran Newspaper, it would be the best idea for publishing text classifieds matrimonial or classified display matrimonial advertisement. As you know, Dainik Jagran is the most circulated and leading Hindi Newspaper which accepts two type of advertisement under matrimonial category: Text Classifieds or ROL, which is a text with black and white advertisement running in character/words in 3-5 lines. These type of ads are cost effective and economical. Secondly, Classified Display Matrimonial Ads are colour with text and image advertisement which comes in boxes according to per cm. square ad space. These type of ads are costly than text classified advertisements.